Coloring the Causeway for a Cure was started with the purpose of helping local individuals and families affected by cancer. 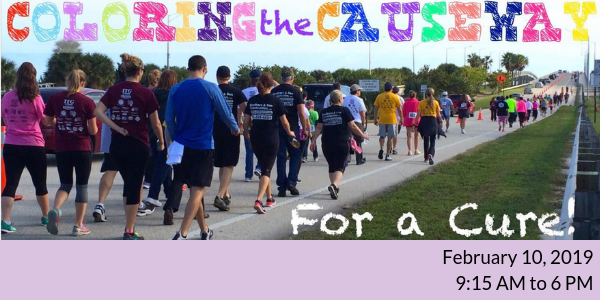 Each year in February we have a 5k walk over the Melbourne Causeway where we invite people to dress up in the cancer color they are there to support (or all the colors) to raise money for locals. We have two wonderful organizations who benefit from our walk; Florida Cancer Specialists Foundation & SCREW Cancer (Surviving Cancer Requires Eternal Will). Read more.